Dec. 1, 2013 9:00 a.m.
One can never predict the growth of a community. The early settlers of Edmonton would most likely be amazed to see how their small trading post has grown to become a large metropolitan center and the capital of a province that didn’t even exist in their time. When Robert Telford decided to put down roots along side a beautiful lake he may have had a vision that the area had a lot of potential for growth, he certainly did all he could to encourage that growth, but it is unlikely he could imagine what the area would become. When the 29-year-old Telford arrived in the Leduc area he came equipped with a vast amount of experience as a carpenter and as a member of the North-West Mounted Police. He and his wife Belle were well suited for life on the prairies and it did not take them long in seeing the potential of their new homestead. They established a “stopping house” which would become Leduc’s first hotel. The stopping house was known as Telford Place and would later become known as the Waldorf Hotel. Knowing that settlers were going to need supplies he worked with partners to establish a general store to provide material for the newcomers. He knew that the homesteaders would need wood to build their homesteads so he got into the lumber business. He also knew for his business to grow the community also had to grow and he encouraged other businessmen to join him and his associates. Things did not go smoothly as in 1893 there was a major economic slump called the Panic of 1893 and it was followed by a major depression that lasted for five years. For two years Leduc saw more settlers leaving the area than entering and a number of early businesses closed their stores and moved away. Leduc’s future looked grim, but Telford and his associates believed in the opportunities the area possessed and when the federal government made changes to the Dominion Lands Act that allowed homesteads to be established closer to the railroad they were able to realize Leduc’s potential. Leduc’s growth was slow but steady during the late 1890’s, and on December 15, 1899 the North-West Territories approved the incorporation of a village and approved the village’s name as Leduc. The name Telford Place was removed from the maps of Alberta and disappeared into history. In 1906 the people of Leduc honored Telford by changing the name of Leduc Lake to Telford Lake. The village council of Leduc held their meetings in informal settings wherever they could find space. As Leduc continued to grow from the 112 residents in 1901 to the 500 by 1906 the council knew that they would need a town hall if they were to become a town. In 1905, when Ephraim Kirkpatrick decided to return to the United States, he and William Mogg sold their building to the village and it was converted into Leduc’s first town hall. 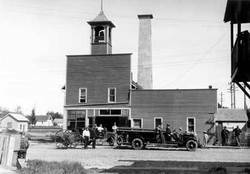 On December 15th, 1906, just seven years after becoming a village, Leduc became a town. The building would serve the town until 1940 when it was replaced by a new structure that would be both town hall and fire hall. It also served as the town’s jail. By 1955 the Leduc’s population had grown to 2,168 and they replaced the fifteen-year-old town hall to accommodate the growing needs of the community. Twenty-eight years later Leduc’s population crossed the 10,000 mark and Leduc became the province’s 13th city in 1983 with a population of 12,700. Three years later the Civic Centre is completed and becomes the home for the city council. Robert Telford established a tradition of community service as he helped the community grow. He served as the community’s postmaster then became its first justice of the peace, was its first representative in the Legislative Assembly of Alberta in 1905 and served for two terms. He then became Leduc’s Mayor in 1915 completing T.A. Norris’s term. After he sold his businesses in 1919 he served on the school board for a number of years. In the beginning municipal elections were held every year and over time progressed to two then three-year terms and beginning with the 2013 elections are now four-year terms. Economics is generally given as to the reason for extending the period of time an official serves. It’s costly to hold elections. Today Leduc continues to grow and as the population moves closer to 30,000 we are seeing the city do things for the first time. In the near future we will see for the first time there are two fire halls and schools built west of the highway. In the beginning the railroad was what drew people to Leduc and businesses were established near the depot and became known as Downtown. Residents knew Leduc for the variety of stores available. Today the railroad no longer draws people, but Downtown Leduc still offers a variety of stores and an opportunity for residents and visitors to see what it was like in Leduc when their grand folks were young. What will Leduc look like fifty years from now? Will we be absorbed by the City of Edmonton? Will we be an independent city of 100,000 or more? Both scenarios are possible and only time will tell. The people that established Leduc in the 1890’s believed in the future of Leduc and that same spirit can still be observed today so if we had to choose we would favor Leduc’s independence to continue long into the future.